Sides at a bar-b-que can be just as exciting as what is on the grill. Pasta salads are bar-b-que staple. I love the traditional mayonnaise based salad but it has been losing popularity. 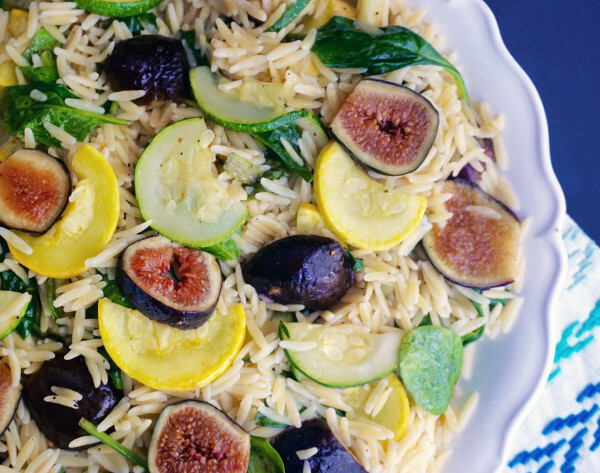 This fig summer squash orzo salad with yuzu vinaigrette is a fresh new take on the ever loved pasta salad. Giving the figs and squash a quick saute gives them an extra boost of flavor. The yuzu vinaigrette has a sweet but tangy bite to it and is much lighter than mayo. Which makes it perfect for a hot day. Yuzu vinegar is gold colored vinegar that has a citrus taste to it. It is sometimes referred to as a Japanese lemon. At my grocery store I found in the aisle that holds all the different cooking oils, vinegars, and dressings. You can also purchase it from O Olive Oil and Vinegar. I love citrus notes it adds to marinades and dressings. Try brushing this vinaigrette on your chicken before throwing it on the grill! Note: This post is NOT sponsored. I will always disclose when a post is in partnership with a product, person, or company. Cook orzo according to package directions, drain, and put in a large bowl. While the orzo is still warm, fold in the spinach letting it wilt into the pasta. Set aside. In large saute pan add a tablespoon of olive oil over a medium heat. Saute the spring onions for 2 minutes then add in the cut squash, sauteing until they begin the become soft. It takes about 7 minutes. Season with salt and pepper and them a mix in the pan. Add in the sliced figs and let them warm through in the pan. Be gently with the figs as they may fall apart a bit but warming them through in the pan gives them a little bit of caramelization.